Today we announced the release of Microsoft Manufacturing Toolkit– a project that came to fruition after nearly a year worth of effort. The release is really exciting for me as I was the Program Manager/Developer Evangelist for the project (my first at Microsoft), driving the efforts from the Global Partner Technical Team, within Developer & Platform Evangelism (DPE) Division at Microsoft. The Toolkit is based on BizTalk and SQL Server. The Microsoft Manufacturing Toolkit is a set of guidance documentation and working code samples that demonstrate the use of the Microsoft platform to build publish/subscribe (“pub/sub”), services-based architectures utilizing open standards for broad industry implementation. The toolkit focuses on the MIMOSA and OPC/OPC-UA organization specifications, and the working code samples demonstrate scenarios that might be implemented in a manufacturing environment. The design of the toolkit is flexible and built on service oriented architecture (SOA) allowing it to be expanded to cover more standards than the ones covered now in the future. The purpose of the toolkit is to provide a starting point for architects, developers, and business decision makers to evaluate and begin building open standard solutions with Microsoft platform technologies in the manufacturing space. The toolkit provides sufficient complexity and breadth of technologies to enable advanced architects and developers on the Microsoft platform to find ample information for expanding upon their current designs or implementations, while at the same time allowing business analysts and other non-technical people to use it. Such end users will be able to design the orchestrations that fit the scenarios they are interested in, or use the powerful reporting associated with it to get a peek into the operations and maintenance side of the business. Asynchronous, loosely-coupled event publication and processing. The technical implementation of the architecture supporting both toolkit samples focuses on the current set of MIMOSA.org service specifications. A second set of samples in the toolkit enables the publishing of an OPC/OPC-UA message. These are applications that generate event messages and publish them to BizTalk Server using the MIMOSA standard Tech-XML messages. Event publishers only deliver the message to the bus and immediately get a generic “success” response from the bus. They do not have to wait until the message has been successfully delivered to any applications that have expressed an interest in the event to the bus itself. The toolkit includes simple Windows Forms applications for generating events and publishing them to the bus. BizTalk Server receives messages from publisher applications, transforms messages, routes them to the appropriate destinations, and ensures message delivery as much as possible, even if the subscribing applications are temporarily offline. BizTalk Server handles all message routing and delivery operations in an asynchronous fashion, thus decoupling the event publisher from managing these complexities. 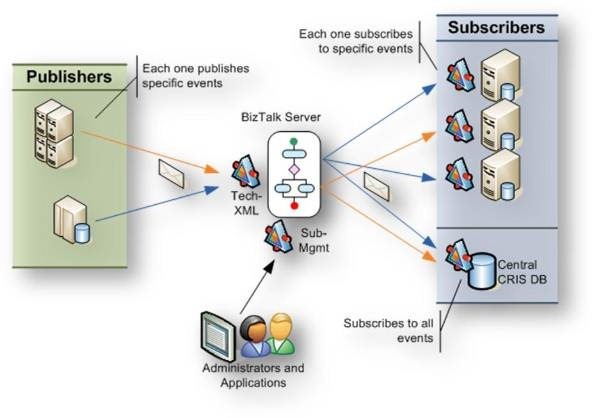 BizTalk Server also enables subscription management, which allows applications and administrators to create, edit, and remove subscriptions to specific events, thus providing a way to control message delivery and routing. The toolkit provides a Windows Forms application to assist the creation and registration of subscriber endpoints. These are applications that also expose standard Tech-XML endpoints. The BizTalk Server bus delivers messages to these applications via Tech-XML service calls based on the subscriptions configured in the bus. Each application subscribes to a specific set of events that it is interested in. This is a Microsoft SQL Server-based database using the Common Relational Information Schema (CRIS) schema, with a Tech-XML service implementation in front. The central CRIS database subscribes to all events in the bus, thus ensuring that it can store all events generated by any publishing application. Instructions for installing the toolkit can be found in the “Getting Started” Guide, which is part of the download. Communicate the availability of the Microsoft Manufacturing Toolkit to your partners, please blog about it; also, download and try out the Toolkit. Thank you!